To me personally this is one of the finds of the year. 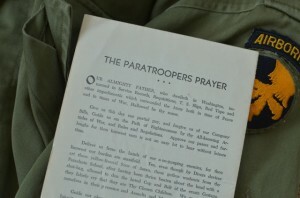 This 8-page folded leaflet printed as advertising for a military supplies store at Columbus, Georgia, contains the Paratroopers prayer (satiric version of Our Father), a letter to a friend from a paratrooper, a letter from a paratrooper to his parents (both also satiric), the Paratrooper’s Song, another song ‘We are the paratroopers’, a song ‘Detail Joe’ and the most famous song ‘Blood on the Risers’. I have made a reproduction of it, more or less on scale to fit a sheet of A4 paper. Download your copy here.